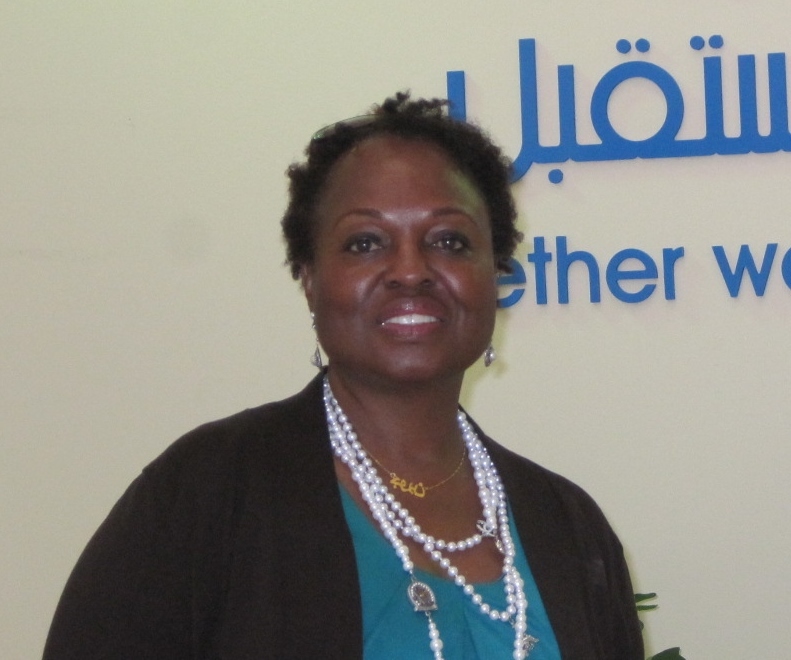 Dr. Gwendolyn Battle Lavert standing in front of the Professional Development Center at Qatar University in Doha, Qatar. Every family has a recorder. I happen to be the one for my family. Hearing my Mama’s oral storytelling about her life strengthened me. Her real life stories gave me the self-esteem, pride, and love that has navigated me onto the path that I travel today. My first experience with writing professionally came as a first grade teacher. I felt compelled to write stories because the students in my class were having difficulty learning to read. The stories and the pictures didn’t depict who they were culturally. I wanted my students to own the stories. After searching for months with very few options, I started writing stories for them. With the stories that I wrote, the students excitedly began to read. As a result, I had a collection of stories that I had written. Afterwards, I had a strong desire to really want to write professionally. 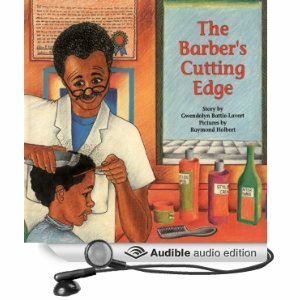 My first book, The Barber’s Cutting Edge (illustrated by Raymond Holbert), was published in 1994. I have worked as a principal, assistant school principal, reading specialist, university professor, and now an International Consultant. Growing up in Paris, I was always writing and drawing. With this early childhood experience, it is no surprise that I’ve found a career as a children’s book author. 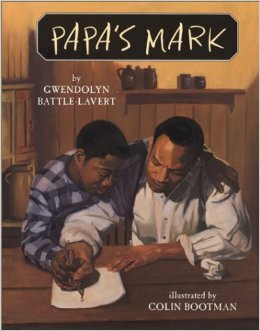 In books that include Off to School (illustrated by Gershom Griffith), The Shaking Bag (illustrated by Aminah Brenda Lynn Robinson), and Papa’s Mark (illustrated by Colin Bootman), I portrays young lives steeped in African-American culture and history. 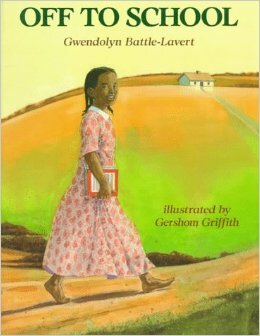 Off to School, for example, finds sharecropper’s daughter Wezielee so obsessing about the possibility of attending school that she over-seasons and overcooks the meals she prepares for her father and his crew at harvest time. This book is about my Mama. But, I used my grandmother’s name. In reviewing the book, Booklist contributor Susan Dove Lempke praised my depiction of “a warm family atmosphere” and a “likeable African American main character” in young Wezielee. 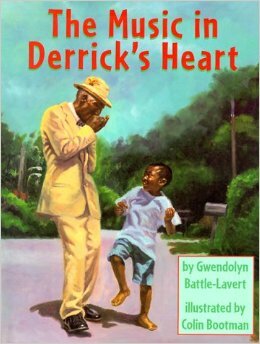 Similarly, in The Music in Derrick’s Heart (illustrated by Colin Bootman), Booklist reviewer Shelle Rosenfeld dubbed it as a “charming, uplifting” tale about a boy learning to play the harmonica with help from a favorite uncle. She also states that my “easy-flowing, rhythmic prose” reflects the story’s focus on “the extraordinary power of music as universal language,” Rosenfeld added. When my mother told me about a man in the community who played the harmonica, her voice was so musical. It moved me to write in this rhythmic prose. I love writing. I have shared my writing with my teaching. I have lived in Doha, Qatar for two years. This International flair is moving my thinking and writing to another level. Holiday House in New York had published two of my books before I submitted my last, Papa’s Mark. So, as I was writing the story, I talked with the editor of my last two books. She was interested. When I completed the story, I sent it to her. It was accepted. However, it took me several years to get to the position of calling an editor and discussing my new ideas. This does not happen overnight. Since my stories are expressive narratives, I like to start with a narrative graph organizer to help guide me in building the Beginning, Middle, and End. I’m a good listener. So, I listen to other people talk. Many times they will say something in conversation that will lead to a story idea. For example, I was talking with a lady in the grocery store. She told me how her Grandfather wanted to vote and be able to write his name on the ballot. All of a sudden, I knew I had to write about this man. This one brief meeting gave me ideas for a story. It was easy to write because I made connections to relatives that had the same challenges. So, I wrote Papa’s Mark. The character Simms came to me. That might sound crazy, but the character appears. I give the character a name according to the period of the story. Many of my stories take place before the civil war. I like that period of time. Is there a technique or routine for drafting or revising that you find particularly helpful? I learned from going to writing conferences that the first draft is never your final draft. I do a lot of revising and revising. Sometimes after I finish, I feel that I need to write it over again. Do you have an office or other location that works best for you? I do not have a particular place to write. I usually write on a notepad long hand just to put the ideas in my head. I then move to my computer desk. Sometimes I type in bed with my laptop. So, the location depends on my feelings. I think that it is more difficult to get books published. However, I still believe that editors are looking for good stories. Children are looking for good stories. So, a writer must not give up. I am so glad to know of her. I have seen her books in a couple of bookstores but not enough. I see her work usually in the school and library markets. I still ask why some of our books are not mainstream?? What can we do to get it going? Very nice article indeed! For many people, pre-Civil War African American history is kind of nonexistent – people have a big gap simply filled with the word “slaves,” but there’s more, and Dr. Lavert is showing us. Thank you!